The power windows can be operated for approximately 45 seconds after the engine switch is turned to the “acc” or “lock” position. They cannot, however, be operated once either front door is opened. 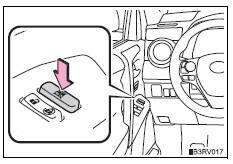 The power windows can be operated for approximately 45 seconds after the engine switch is turned to accessory mode or turned off. They cannot, however, be operated once either front door is opened. If the window still cannot be closed even by carrying out the operation as explained above, initialize the function by performing the following procedure. Press and hold the power window switch. Continue holding the switch for 1 second or more after the window has opened completely. Hold the power window switch in the one-touch closing position. Continue holding the switch for 1 second or more after the window has closed completely. The driver is responsible for all the power window operations, including the operation for the passengers. In order to prevent accidental operation, especially by a child, do not let a child operate the power windows. It is possible for children and other passengers to have body parts caught in the power window. Also, when riding with a child, it is recommended to use the window lock switch. When exiting the vehicle, turn the engine switch off, carry the key and exit the vehicle along with the child. There may be accidental operation, due to mischief, etc., That may possibly lead to an accident.